This trip is for if you’ve already seen London and Edinburgh and you want to see a bit more of the countryside. For this tour, you’ll want to pack your waterproof trousers (rain pants, in American parlance) so you can break up all that time in the car with some wanders in the hills. This itinerary would also be lovely for families. Sometimes, I find that dragging small children through large cities is not nearly as fun as you might think. So to the countryside we go! Day 1: Fly into Manchester. Hire a car and drive to the Lake District. I would recommend stopping in Windermere, Ambleside or Grasmere for the night. 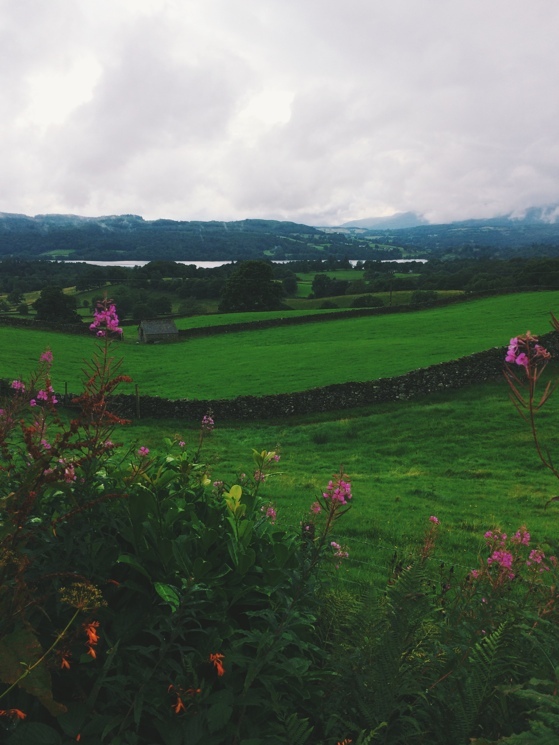 Wander a Lake District village on foot before having a hearty meal in a cozy spot before bed. Take it easy if you still have jet lag and go in for an early night. Start the day with a morning walk around a lake, followed by a cream tea of course. Walk through more of this gorgeous country in the afternoon or go and visit Wordsworth’s grave in Grasmere. Drive on to Keswick in the evening or even as far as Buttermere if you’re loving these scenic routes. Have one more morning wander on a fell before packing up and driving on today. Consider stopping at the Castlerigg stone circle as you leave the Lake District. Drive north to Scotland. Enjoy the afternoon sun if you’re lucky enough to have it. Enjoy the views of the Highlands as you make your way to (or almost to) Fort William. Stop anywhere on the road to Fort William in any number of small B&Bs before it gets dark. You don’t want to miss any of the scenery along this road. 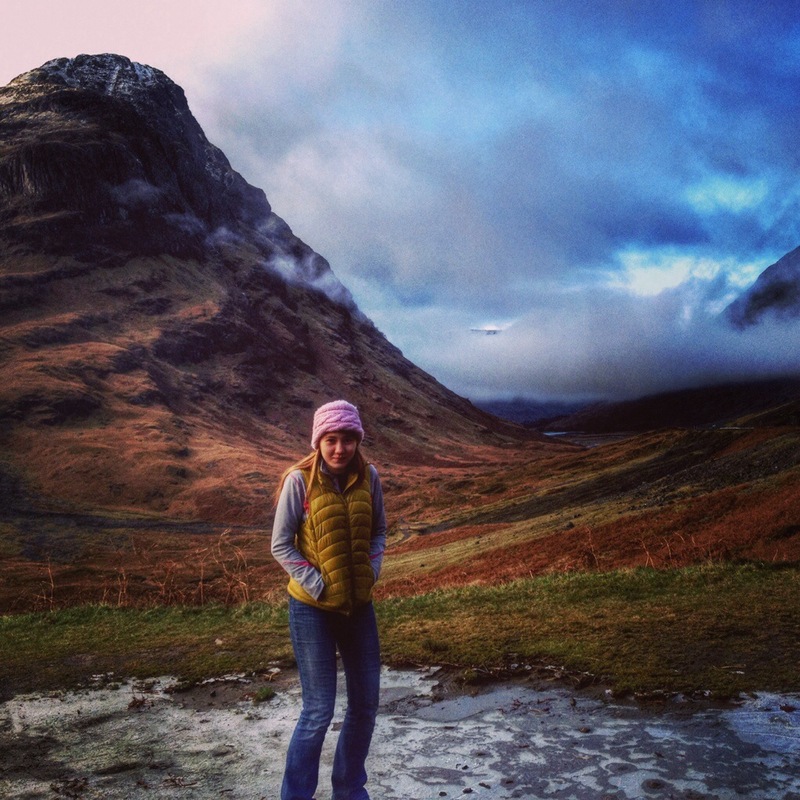 Spend today around Glencoe and Loch Ness. Get a local to tell you about the massacre in the glen or the story of Old Nessie. Maybe stop in Fort Augustus. See Urqhuart Castle and Eilean Donan Castle. Stay somewhere on the road along Loch Ness or if it’s summer, the light is long and you want to push on, drive on to Ullapool. Very few folks get this far north in Scotland. Single lane roads will take you to some of the most remote villages and beaches in the world. 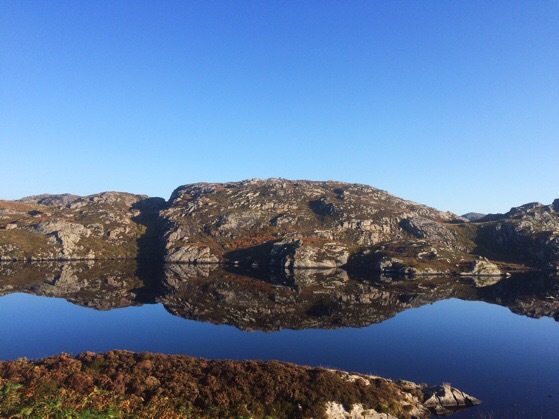 Drive to Lochinver (and eat at the pie shop there) and then choose an easy loop wander through this area. Drive to the beach and lighthouse in Stoer, and walk on to the Point of Stoer if you want a little longer hike. Drive back south to stay in Ullapool for the night, and enjoy a classic west coast sunset. Drive to Inverness by way of the mountains. Maybe stop there for lunch before heading on to Aviemore for the night. Stop for a whisky tour or a hillwalk as you drive southward. Day 7. Aviemore to the English sea side. 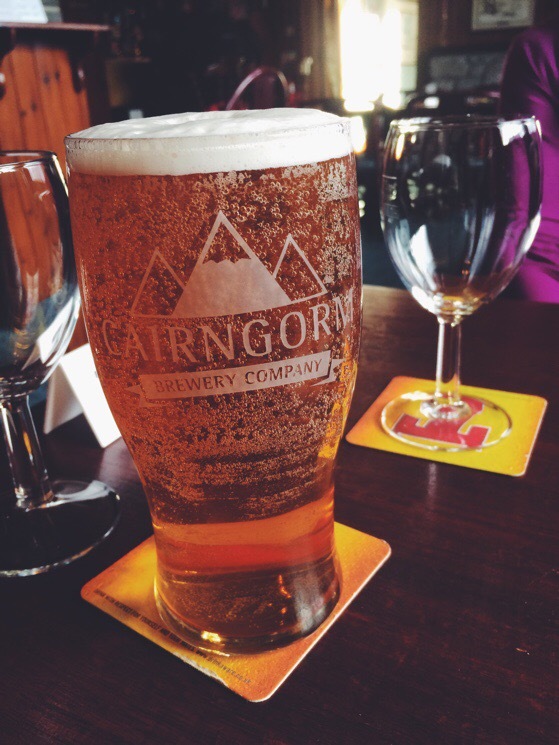 Have breakfast at the Mountain Cafe in Aviemore before you push on. And if you need to stretch your legs, walk through the National Reserve that’s just south of Aviemore or ask your host for a recommendation for a walk. This area is full of great trails! Drive south all the way to the Border town of Berwick-upon-Tweed. Day 8. Beach towns by the North Sea. 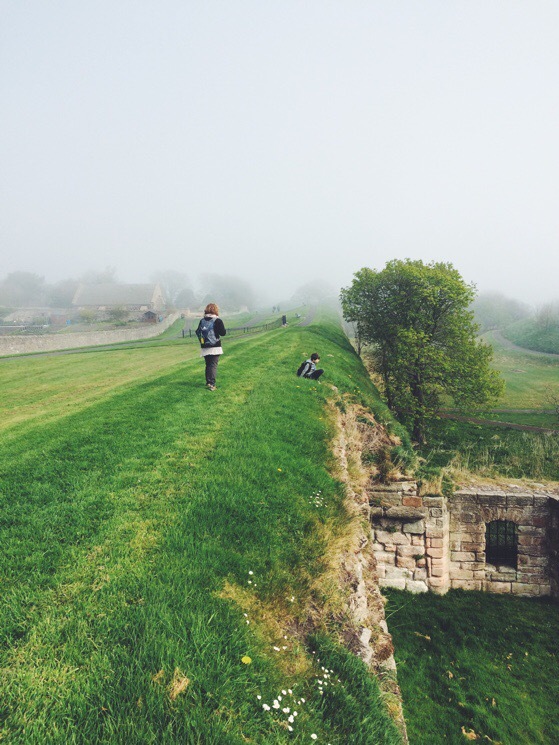 Be sure and walk the old city walls around Berwick-upon-Tweed and the path that goes by all three bridges. Then drive south to Lindisfarne, the Holy Island that you can drive to only at low tide. Watch the tide schedules or you’ll be stuck on the island for the night. There are several lovely B&Bs there, so if you have to spend the night, no worry. Push on to Whitby and sleep in or near this seaside getaway. Go to the ancient abbey. Walk on the beach by the colored huts and have ice cream and fish and chips here where the salt air makes everything taste yummier. If you tire of Whitby, drive down to Robin Hood’s Bay and have a pint at the famous pub where daily those who’ve walked all the way across England end their journey. Drive to York first thing so you have the day to spend in Yorkshire’s capital. 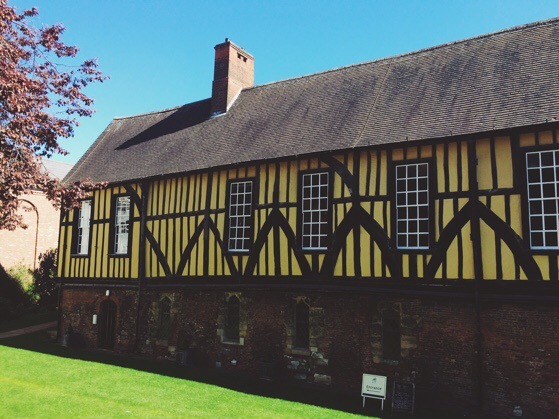 You can wander the ancient city walls, visit the Railroad museum, eat chocolate, attend Evensong at York Minster and celebrate your road trip with a yummy pub dinner. 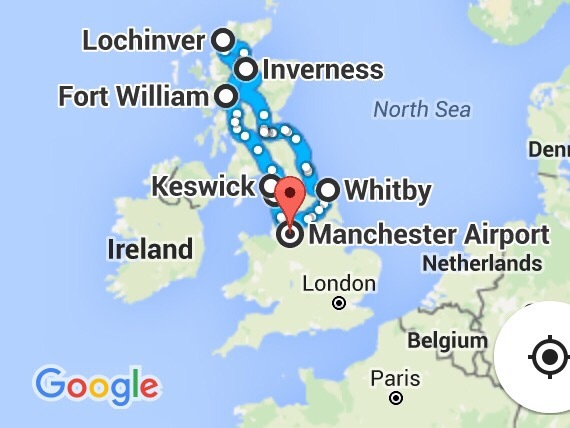 Sleep in York tonight and drive on to Manchester the next day. Or if your flight is early, drive on to return your car and sleep at an airport hotel. Day 10. Fly home via Manchester. Flights. I use several different websites/apps to search for flights: Kayak, Momondo and Skyscanner. I chose Manchester because there are lots of international flights that land here, but this circle road trip could also start and end in Glasgow or Edinburgh. I have not actually visited the city of Manchester, but you could easily add on a day to do that if you wanted. Packing. Your time in the UK will be so much more pleasant if you are not weighed down with lots of luggage. When you are renting a car, you have a little bit more room for things, but when you’re moving hotels every day or every couple of days, it’s still a great idea to pack light. Here is what I pack when I am galavanting around Europe. Money and credit cards. The best way to pay for everything in the UK is to use a credit card that has a chip in it. Also, side note: You want to get a credit card that does not have international fees before you come. Both Chase and Capitol One offer cards with chips that don’t have international fees. You can also use your debit card to get cash, which some places will require. I try to use my credit card as much as possible because my bank does charge me a fee to pull out international currency. However this fee is generally lower than the one I would pay to exchange American dollars. So I leave all cash at home and just bring my credit card and debit card. Also, I specifically left off the Isle of Skye since I included it as a possibility in my other UK itinerary. But it would be very hard to choose between seeing the Isle of Skye and the Northwest Highlands. Any other questions about driving around the UK? Ask away, and I’ll try to answer them. If I’ve left out your favorite village, it’s probably just because I haven’t been to it before, so tell me why we need to go! Love this Alison! Thank you. Visiting in August with my teen and tween boys and we love to hike. Staying a few miles from Inverness for a week and a week in Glasgow. Would love your suggestions hiking as we will use the cabin near Inverness as a base for day trips. Thanks so much for sharing your ideas! Wonderful to hear that your feet are taking you all over the UK! You will be building many lifelong memories for your family! It sounds like you have such a fun trip planned!! We use this database of walks around Scotland very regularly to find hikes no matter where we are in Scotland, so I’m sure it would be helpful to you as well for your trip! Okay, I will check the site, thanks again Alison. Your blog posts have provided so much information, I appreciate all the tips, and will take a good look through your older stories for more ideas. Thank you, enjoy your last few months in Scotland, and then you can continue your walks when you return to the U.S. If you like Scotland, you should take a trip to Newfoundland. Many similarities and it’s gorgeous. Thanks so much!! We’re trying to make the most of our last months in Scotland, getting out in all kinds of weather! I have always wanted to visit that part of the world!! We’ve road tripped through lots of parts of Canada but have always missed the East! On the list for sure! !